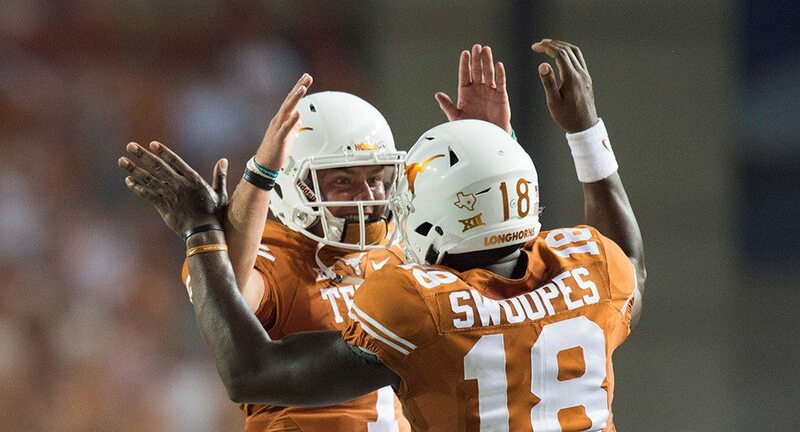 Freshman Shane Buechele, left, got the start, but it was Tyrone Swoopes who scored a pair of overtime touchdowns to life the Texas Longhorns to a dramatic 50-47 victory over No. 10 Notre Dame (photo courtesy of texassports.com). AUSTIN, Texas — With the Texas football program in dire need of a signature victory to propel the proud program back into college football's upper echelon, the Longhorns turned to a tried-and-true strategy — man-on-man, stop-us-if-you-can, smash-mouth football — with the game in the balance. Backup quarterback Tyrone Swoopes rammed his way into the end zone on a six-yard keeper in the second overtime to propel the upstart Longhorns past 10th-ranked Notre Dame, 50-47, Sunday night before a stadium-record crowd of 102,315 at Darrell K Royal-Texas Memorial Stadium.